It turns out that the game from last year that has gotten near-universal praise and made it onto multiple best-of lists is actually pretty good. What Remains of Edith Finch came out about a year ago, and I bought it at the time to show my support for small game development studios and immersive storytelling. But I never got around to playing it until last night. Even though it’s gotten near-universal praise, I’d assumed that I got the gist of it and didn’t need to dive in right away. I rarely play games anymore as it is, and I haven’t been in the mood for what I figured was going to be another artistically-minded and well-crafted but predictable and passive walking simulator. Turns out I was mistaken. This game is a masterpiece. Everybody at Giant Sparrow should be immensely proud of it, for everything it gets exactly right artistically, technically, and tonally. It seems effortlessly beautiful, unabashedly earnest without being maudlin, intriguing without being obtuse, and profound without being pretentious. I reckon I’m still only about halfway through, but I had to stop playing because I was sitting in the living room straight-up heaving-sobs ugly-crying over one of the stories. I can’t remember the last time a video game has made me cry — well, the last time playing a video game has made me cry, anyway — and I know that none have hit me that dramatically. What’s remarkable to me is how much the game earned it. To be honest, it doesn’t take a whole lot to make me cry; movies have been able to do it with increasing regularity, and it usually resonates only as much as a jump scare. But the scene in Edith Finch (at the risk of spoilers, it’s Gregory’s story) wouldn’t have worked outside of a game. Or, more accurately, outside of a game as thoughtfully and skillfully made as this one. The story itself is real, and it’s tragic, but it’s also been made maudlin by its overuse in shallower stories. It’s been reduced to a background sketch in adult contemporary fiction, or made trite like Hemingway’s saddest short story. In Edith Finch, though, the audience’s perspective and interactivity are used to flip the focus; the story isn’t about a tragic death but a joyous life. You already know what’s going to happen; that’s not only something that’s been foreshadowed several times over, but has by this point revealed itself as one of the game’s main themes. 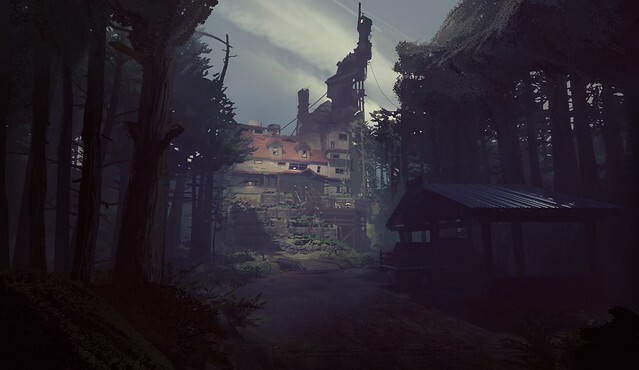 But the genius of Edith Finch is that it forces you to confront, accept, and even embrace the sinister premise behind each story, so that you can see for yourself the joy, or beauty, or humor, or exhilaration of it. It takes the “don’t go into that room!” moments from horror movies and games, then makes that idea literal as the game’s recurring theme and core “mechanic.” And then it uses that tension and suspense not for horror (or rather, not just for horror), but for empathy. The reason I put “mechanic” in scare quotes there was because What Remains of Edith Finch isn’t a game, and it’s also the best possible illustration of why the argument of what constitutes a “game” is irrelevant. At first, even while I was marveling at the beauty of the art direction — it’s a marvelous example of being simultaneously painterly, realistic, intriguing, mundane, sinister, and familiar — I was bristling at the lack of interactivity. I was getting so annoyed at passively listening to descriptions of objects, needlessly fiddling with the controls for what should have been simple interactions, and illusory choices that had no real consequences, that you’d think I’d never worked at Telltale. But then the game started changing the way I interacted with things, and it started to make me realize the implications of those changes. (As long as I’m gushing, I’ve got to mention that the pacing of the stories and the order in which they’re presented is masterful, although it’d be easy to take for granted). A gameplay loop develops inside each story: what am I trying to do?, how do I do it?, and then why am I doing it?, and you realize how the process of answering those questions either reveals or emphasizes the theme of each story. The loop is a bit like Wario Ware, except instead of picking someone’s nose, you’re getting insight into the joy and sadness inherent in the nature of human existence. As a result, even the relatively simple moments can become profound and poignant. Calvin’s story, for instance, takes place entirely on a swing. You know what’s going to happen, but the game doesn’t let you continue until you actually do it. By the end, you understand why the game made you do it — you have to do it to see what it feels like. At which point everything seemed to click in place and the metaphors made sense to me: a house full of sealed-off rooms that you can only peek into. An anthology in which you know from the beginning what’s ultimately going to happen to each character. A mystery that reveals its killer at the beginning, but forces you to see for yourself what happened. An interactive experience in which your actions aren’t defining the shape of your narrative, but making you better able to understand and empathize with someone else’s. It’s constantly surprising, both in how frequently it shifts between different tones and different game mechanics, and in how masterful it is in doing it. Over the course of my half-playthrough, it’s already changed my perspective on the potential of “walking simulators” and whether or not they were a storytelling dead-end. It’s also seemingly transformed from sinister haunted house story to a funeral memorializing a bunch of dead characters and then into a wake celebrating their lives. I feel like I already know how it’s going to end, but I still can’t wait to go through it and see for myself.